HURRY over to get this Disney Frozen Anna and Elsa Cool Tunes Sing Along Boombox for ONLY $13.99 (Retail $29.99)! Cool Tunes! Sing your heart out with your very own Frozen Sing Along Boombox. 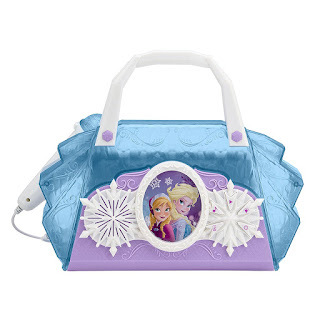 Whether you want to listen and sing to Anna &amp; Elsa's favorite songs or yours, you can with your own boombox. Take your boombox wherever you go by using the handle and you can store your MP3 player in the compartment in the back.